Update: This is a self-guided walking tour that I put together after our trip to Salem in October 2013, which just happened to be the 20th anniversary of Hocus Pocus. You can read more about our trip here and here. We are not running a tour (although I would love to spend all of October in Salem talking to people about film!). If you’d like to take a tour of Salem, there are many great guides out there. You can also check out my post on the Canadian town where Gilmore Girls was first filmed and the house built for Practical Magic, Happy Hauntings! 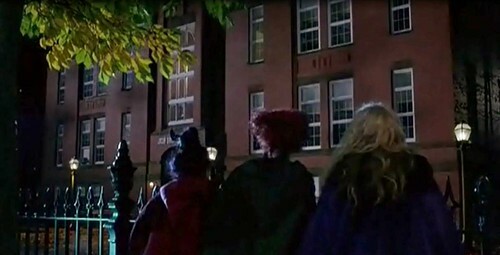 Hocus Pocus is one of my all-time favourite Halloween films. It was the right mix of funny and scary when I was a kid and I can still appreciate it to this day. From the outstanding costumes to the beautiful locations and spectacular sets – it really is a great film to watch this time of year. It’s hard to believe that 2013 marks its 20th anniversary! 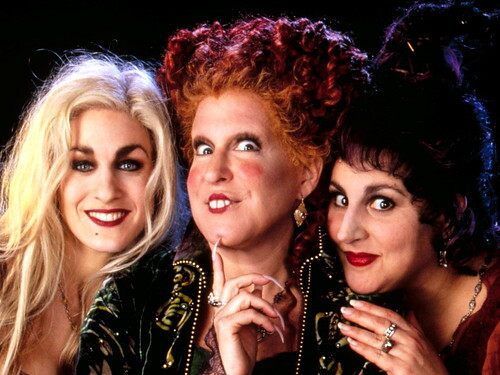 Starring Bette Midler, Sarah Jessica Parker and Kathy Nijimy, Hocus Pocus tells the story of the Sanderson sisters – three witches with a taste for children who are hanged during the Salem witch trials. After 300 years, the witches are accidentally resurrected on Halloween night by Max, a teenager who wasn’t feeling the Halloween spirit until now. It’s up to Max, his sister Dani, his high school crush Allison, a friendly zombie and an immortal cat named Binx to put an end to the witches’ reign of terror once and for all. While Garrett and I were in Salem, Massachusetts this weekend, we took our own little Hocus Pocus tour, visiting many of the real locations that were used in the film. You can’t do a Hocus Pocus tour and not go see Max and Dani’s house. Built in the 1870’s, this house has become a tourist attraction of its own since the release of the film. We weren’t the only ones on the street that day taking pictures. 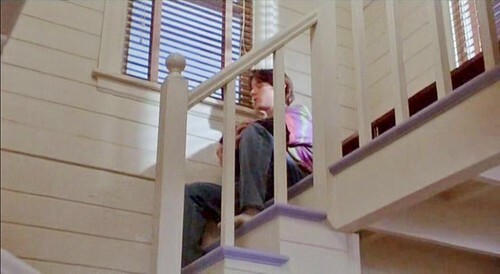 I think that every kid who grew up in the 90’s wanted their own lookout tower like Max. The stairs were in his room, leading up to the tower. Perfect place to be a sulky teenager full of angst. Nice tie-dye t-shirt too. 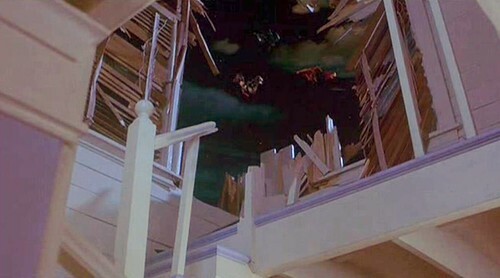 Later in the film, after seemingly destroying the witches in their high school’s kiln, Max and Allison open the Sanderson sister’s creepy spell book in his room. Before you know it, a beam of light shoots into the night sky, lighting a beacon for the witches to come and find them. The tower was destroyed as the witches fly off into the night with Dani. 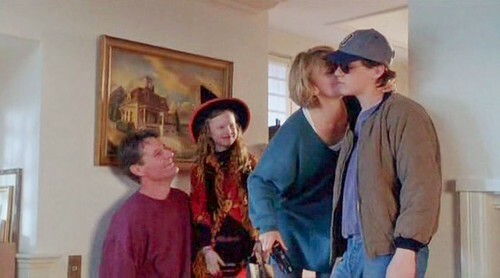 A painting of the house can be seen in the background of this scene with Max and Dani’s parents. I always wonder where props like that end up! 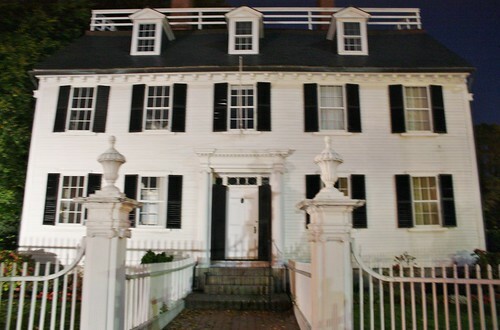 The exterior scenes of Allison’s house were filmed at the Ropes Mansion. Built in the 1720’s, this Georgian Colonial mansion is rumored to be haunted. It’s now owned by the Peabody Essex Museum and open to the public. In the film, the house was decorated for Halloween with pumpkins, hay bales and candles. We didn’t go into the house when we were there, so I’m not sure if it was used for the interior shows of Allison’s parents’ party. Often the interior shots of films are done on a sound stage made to look like the house. 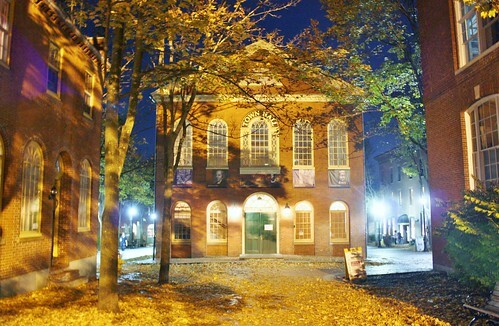 Used as the exterior location of the party that Max and Dani’s parents went to, Old Town Hall dates back to 1816 and is the oldest surviving municipal building in Salem. The hall currently houses the Salem Museum. and productions of the plays Cry Innocent and History Alive. During the end credits, all the parents in town can be seen leaving the building, exhausted after dancing all night under Winifred’s spell. The opening village scenes from 1693 were recreated in the Salem Pioneer Village in Forest River Park, just one block away from Max and Dani’s house. The village was built in the 1930s as a set for a play series in the park, but after the interest in it continued, the city reopened it that year as a museum. 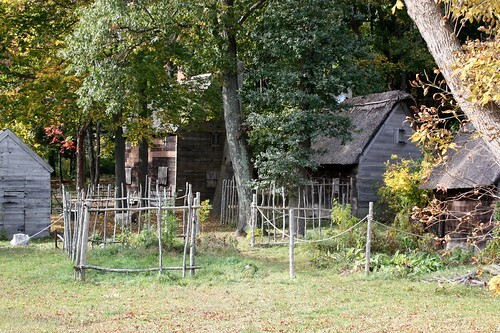 It was the first living history museum in the United States and gave visitors a look into the lives of early settlers. 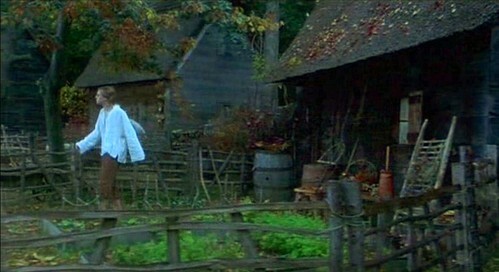 In the opening credits, you can see Thackery Binx (not yet turned into a black cat) walking through the village looking for his sister. He and his friend go running out of the village into the woods, looking for his sister who they find at the Sanderson sisters’ cottage, which was built on a Hollywood sound stage. There were a couple more locations in town that we missed while we were there, but are worth checking out if you visit Salem. A year before filming began, Phillips Elementary School shut down, making it the perfect location for the fictional John Bailey High School. This is where we’re first introduced to Max and Allison, and where they later try to burn the witches in the art room’s kiln. The park across the street, Salem Commons, was used for the scene where Allison pretends to give Max her phone number. 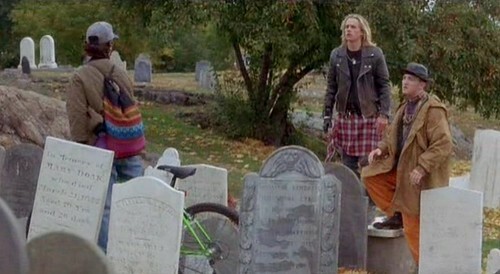 Old Burial Hill, in neighboring Marblehead was used for the day time exterior scenes. 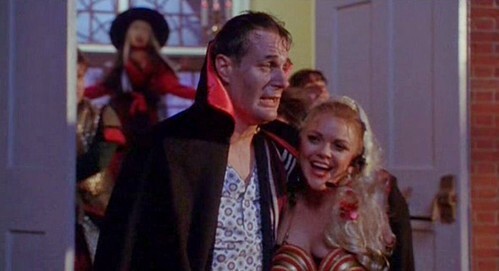 Nighttime scenes such as the resurrection of Billy Butcherson, the friendly zombie, were done on set. Old Burial Hill is one of the oldest cemeteries in America, founded in 1638 and contains many historic Puritan graves including the remains of a victim of the 1692 Salem Witch Trials. If you haven’t seen Hocus Pocus in a while, it’s worth a revisit. Perfect for this spooky time of year! I also recommend a trip to Salem – it’s a great town rich in American history, ghost stories and great people. I hope we can go back there again soon! Very cool. My Mom lives in Salem, MA and loves it. So many cool (and spooky) places to visit. It’s super crowded right now so we will plan to visit AFTER the big day…plus it’s a little scary for the kids. I actually have ancestors from the Salem Witch trials and am currently starting a screenplay on another aspect of the trials. The witch hysteria had a lasting effect on the United States. During 1692, there were about 600 inhabitants in Salem Village and eventually 200 of them were accused – mostly by disturbed young girls wanting to stand in the spotlight, and by landowners hoping to grab the land of the accused. it wasn’t even safe being called to testify at the trials – the girls would be apt to accuse anyone within their eyesight! My ninth-great-aunt was on record refusing to testify against her sisters-in-law. Another elderly farmer in his eighties refused to testify (they would have legally grabbed his large farm if he confessed or was convicted), so Giles Corey was subjected to the procedure called “Presse-Dire” – they loaded boulders onto him over two days to press him to testify. But he refused and his last words before he died were: “More weight.” The name of Salem Village was changed to Danvers to try to erase the stain of this shameful period of American history. We met an awesome tour guide (mentioned it in my first post on Salem) who told us the same theory on the witch trials. So interesting that you have an ancestor from that part of history. I’m so glad we made the trip to Salem and learned more about it. This is the coolest post ever. 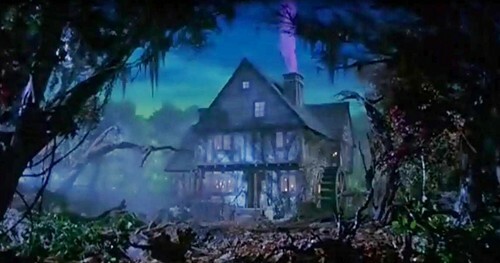 It would be awesome if they made the Sanderson Sisters house as well, it could be a gift shop/attraction. Make it a replica of the one in the movie, during October they could have hayrides that lead to it, maybe have a showing of the movie. I got to see the creepy eyeball book and Winifred’s outfit at a Disney exhibit in Chicago last fall it was awesome! I agree! It would be a great tourist attraction. That is so cool that you got to see the props in Chicago. As the first licensed tour guide in Salem (1964) and as my namesake arrived in Dec 1630 with Roger Williams, I have always been interested in the actual history of the city. Salem was destined to be the capital but when the Arbella arrived with Gov. Winthrop the same day his son Henry attempted to swim across the North River to an Indian village (where a junk yard soon to become new condos resides) and drowned. His father was so filled with grief that he refused to stay in Salem and founded Boston further south along the coast. The actual location where the “witches” were hung and thrown from the small cliff behind which is in back of the current location of Walgreen Drug Store on the corner of Boston and Bridge Streets. If you read the first person accounts in Samuel Purley’s History of Salem, MA you can learn why I know the exact location: It’s on line: http://catalog.hathitrust.org/Record/006784546 Also the so called “Witch House” was the actual home of Roger Williams and this was proven way back in the 1800’s but of course in the 20th century it became popular to associate it with the second owner, Judge Jonathan Curwin and his participation in the witch trials. I could go on and on of course, but anyone interested just copy and paste the link to a collection of FIRST PERSON accounts which Samuel Purley compiled into the early history of the city of Salem, MA. Just noticed this lovely site. I was just starting to think about Halloween, and wanted look up Hocus Pocus stuff. I was the Production Designer on the film. I picked all those locations you talk about. I spoke at the 20 yr. screening at Disney a few years ago. We all agreed it was the most fun you can ever have on a film. I love that it plays on T.V. every year. Anyway, just wanted to say how much the film means to me. My husband and I just looked up your credits on IMDb – we’ve seen at least 75% of the films that you’ve worked on and loved them all. As a former film school student and small-time producer, it’s so inspiring to see such an impressive legacy you’ve had. I’m flattered that you’d take the time to comment on the post. It was a really fun trip to Salem and made us feel like kids again to see all those iconic locations. Thanks for making one of my favourite childhood movies so magical. I love catching it on TV every year too. How fun for you Mr. Sandell, my youngest daughter was born the year HP came out. We watched it every season, bought the “tape” and then the DVD and it’s her favorite movie of all time now. We visited Salem in early 2000, but at that time didn’t think to look up the sites used in the movie. Actually I think we thought they were just stages somewhere else. So glad you posted here. And I hope the rumors of a HP 2 are true and you can be involved for more fun! My Mom and Dad still live in the house and are 87 and 91 years old, respectively. They still get visitors just about every day wanting to see Max and Dani’s house. In October the number of visitors gets so large that they almost need crowd control personnel. The movie is obviously a favorite of many people. We all (my family) remember you fondly. I specifically remember how much you loved New England and that, shortly after you left, we were experiencing a hurricane and you called us to see if we were okay. I am so glad that your memories of making the movie are as happy as ours are. It was a wonderful experience for all of us. It’s funny that I live in the next city over from Salem and never visited these sites. I guess I take for granted what is in my backyard. I go into salem every year for Halloween to check out the cool costumes. Now I’ll have to check out these sites. Loved the movie! Was born and raised in Salem, MA, graduated from Salem High in 1975. Lived in Salem until I moved to Mesa, AZ in 2009. 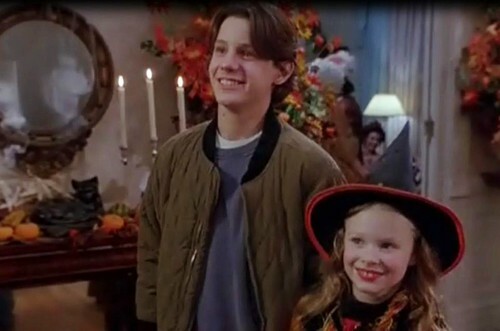 I remember them doing the filming of Hocus, Pocus and loved the movie. My grandmother stood on the hill of the old Salem High and watched as the Salem Fire burned half the city in the early 1900’s. My Grandmother was born in Canada late 1800’s and moved to Salem with her parents and her home was one of the few that were on the edge of the fire and survived. One of the courses that they taught at Salem High in the 70’s was History of Salem and I was so into Salem’s history that I took that course and was so glad I did. I am looking forward to returning to visit someday to see my hometown. Thank you for posting this and I am so grateful for having this to read and reminisce. I’m glad that my post could bring back some nice memories of Salem for you. We thought it was such a charming town and I can see why you loved it. I grew up in Lynn which is right next door to Salem. My oldest brother and his family live in Salem. Best place to visit on Halloween! The whole town goes crazy! All the places were this movie was done are places I went to as a child! Best movie ever! ? That’s cool that you grew up so close! It definitely gets you in the Halloween spirit when you’re there! When will this be in Salem, MA??? Hi Sarah – this is just a self-guided tour that I put together after our trip to Salem. Anyone can walk to themselves and see the locations first hand! These locations listed are they in the order as they should be visited? They’re not in any particular order. You may want to look them up on a map and plan out a route that works best for you. Hi Teal – this is just a self-guided tour that I put together after our trip to Salem. Anyone can walk to themselves and see the locations first hand! 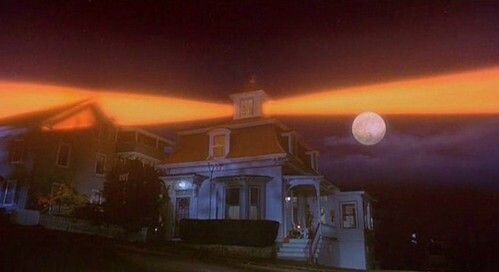 Are the houses decorated around Halloween like in the movie? Is there a special event planned for the 20th anniversary? I would love details. I didn’t see any on the site. The 20th anniversary was in 2013, which is when we visited Salem. This is a self-guided walking tour that anyone can do themselves! Hi I love this post !! This is exactly what I plan on doing when I go visit this October !! Do you recommend a particular place to stay ?! Is there anything nearby that I could look into staying almost walking distance?! You’re response is very much appreciated thank you so much !! You must go Maria! It’s such a fun town to visit in October. You can read more about our trip to Salem here and here. We stayed at a hotel in Peabody and drove in each day, mainly because the hotels in Salem were either booked up or too expensive. There was lots of public parking and we’d just find a central location to park and walk around all day. We also went to the Keene Pumpkin Festival in New Hampshire that weekend and stayed at a B&B in Vermont. It was a great trip! I’m wondering when these tours are, and how to make sure we have a spot on it if we’re taking the trip. Is there a number I can call? I want to make sure to get to Salem and see all of it!! This is a self-guided walking tour that I put together after our trip to Salem in 2013. Anyone can do it themselves and it’s free! The opening credits is a fly over of Plymouth Plantation. We met one of the staff who had to keep everyone maning the chimney fires so it looked like an active village. I love that scene. Until we looked it up, I had always assumed it was a village set that they’d made for the movie, but I love that it was actually a historic reenactment location that you can still visit. I wish we’d been able to go inside while we were there. How much does it cost to take this tour!?!? I’m totally interested in this Hocus Pocus tour on October 23. How do I sign up to attend? This is a self-guided walking tour of the locations that I put together after we visited in October 2013. Anyone can visit the locations themselves and learn more about the history at each site. I went to Salem ad Boston this summer. 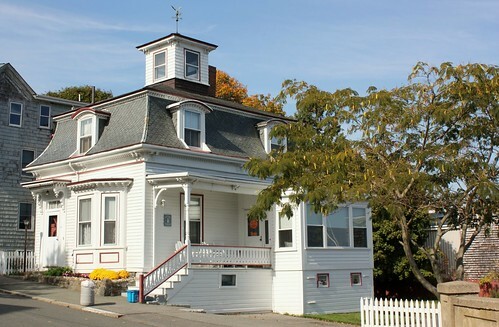 The interior used for Alison’s was filmed in a mansion in MarbleHead. The outside was used just when they are staring at it and Dani lays on the haybail. Cool! I hadn’t heard that before. I love the interior of the house in that scene. Thanks for sharing! Don’t know if this was mentioned in the comments I didn’t read them all. But the Forest River Park you can only see the village from June through September and its scheduled tours only. We went today without knowing this and were very disappointed we couldn’t go in. Thanks for the update Kara. When we went in 2013 they did have it open on weekends. We moved to Salem in April 2015 and our house overlooks Forest River Park. I take my son there nearly every day. I’m writing this because we just had our July 4th block party with our lovely, friendly neighbours right outside the Hocus Pocus house but I had no idea of its history! I walk past the Hocus Pocus house all the time on the way to town and the old couple who live there are usually sitting on the porch. We always say hello to them. My son’s preschool is also right next to the Ropes Mansion. I’ll definitely be renting the movie soon so we can cheer every time we see a location that’s familiar to us now. Paul, that old couple are my parents. They love sitting on that porch and talking with the people who pass by. We moved into that house when I was three months old, 54 years ago already. It was an incredible place to grow up and I am thankful every day that my dad decided to buy it (without even consulting my mother first!). Our neighborhood in Bath, ME resembles the opening scene of swarming children trick or treating, where we have over 500 kids that come for treats. Thankfully, very little trickery! I am a descendant from one of the judges near the end of the trials. I believe he is the one that stopped them. I also will not ask about a spot on the tour! LOL … Amazing how people don’t read for comprehension anymore ? Is this an all year round thing or just in October? I’ve been to Salem, Ma many times and didn’t know this until my last trip in 2014 when we got a guide from the Haunted Footsteps tour who took us and told us of it!! I’ve also stayed in Danvers (old Salem) and visited the Bridget Bishop house, which is a must see for Salem history enthusiasts! Unfortunately I am not able to go this year but I can’t wait to go back next year! The inside of the school was filmed at East Whittier Middle School located in Whittier, California. Did you walk this whole tour and did you go in this order? I am planning on visiting next month and am trying to plan my route. If you could help with any of this it would be greatly appreciated! Thanks for sharing your experience! Hi Rosa! We did the locations in the downtown area while walking around to see Salem, but we drove to the pioneer village and other spots. If you look up the locations on Google Maps using the addresses I’ve provided, you’ll be able to map out a route that works for you! I went to Salem in April 2017 and took a picture of Max and Dani’s house. 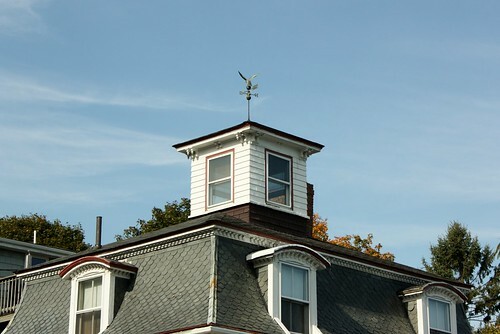 I didn’t notice anybody in the “lookout tower” of the house, but after checking out my pictures, it looks like there is a man sitting up in the window. It’s pretty cool! This is wonderful. I LOVE this movie and dedicate one night every October to watching it with my family. Here’s an interesting fact for those of us who live on the South Shore of Massachusetts. 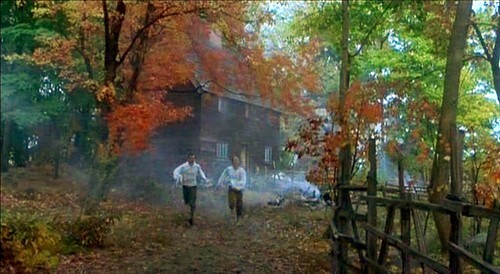 While the bulk of the filming was done north of Boston, the opening credits—which begin with a “witch’s flyover” we’re to believe of the New England village below—is actually Plimouth Plantation in Plymouth MA.